We ride on country roads to witness the untouched natural charms of Luang Prabang, from beautiful waterfalls to peaceful towns and villages. While cycling we also explore the locals' culture and along the way visit a handcraft village and savour delicious dishes of local delicacies prepared by our welcoming friends. The rides are mostly on tranquil paved and dirt roads that will lead you through the magnificent natural surroundings along the Maekong River. This is quite a pleasant ride to enjoy the scenery and culture of Laos. There are some short climbs on this ride so a moderate level of fitness is suggested to enjoy the most out of your cycling experience. In the event of inclement weather making the track impassable an alternative route will be offered. Our ride will pass through the natural farming and stop at different local villages where leads us in the ambiance of hill tribe locality and touch their way of life till reaching our destination at Ban Nongphou where we stay over in homestay style with host family. Take a ride on small trails from village to village and stop for lunch at a bamboo hut, then continue to the next village where it can be seen the native craft works making. On the way back to Luang Prabang is by ferry. Our tour guide Choi was outstanding. Very friendly, outstanding English, focus on having a good ride and outstanding knowledge of Laos history and culture. Mr Thongchan was very friendly and provided excellent support for my wife and I. it was a pleasure riding with him as he was very adaptable to our needs. The two day tour around the countryside outside of Luang Prabang is definitely worth it. Plenty of moderate sized hills to make it a reasonable challenging, but very enjoyable ride. We ride on jeep-width dirt tracks for the majority of the trip so some off road riding experience is suggested. The ride starts and ends in Luang Prabang, with an overnight stay in local accommodation in Ban Nongphou. We ride a total of 83 km and once we cross the Mekong the trail undulates, with lots of short climbs which can be tiring. Those with a moderate level of fitness will enjoy the riding. Traffic is exceptionally light and we will see few cars. After departing at 8:30 am from your hotel, we cycle to the river bank and take a ferry to cross the mighty Mekong River to Ban Xeng Mean. We cycle off-road, exploring the area with several stops to take pictures before reaching the village of Ban Nakham. 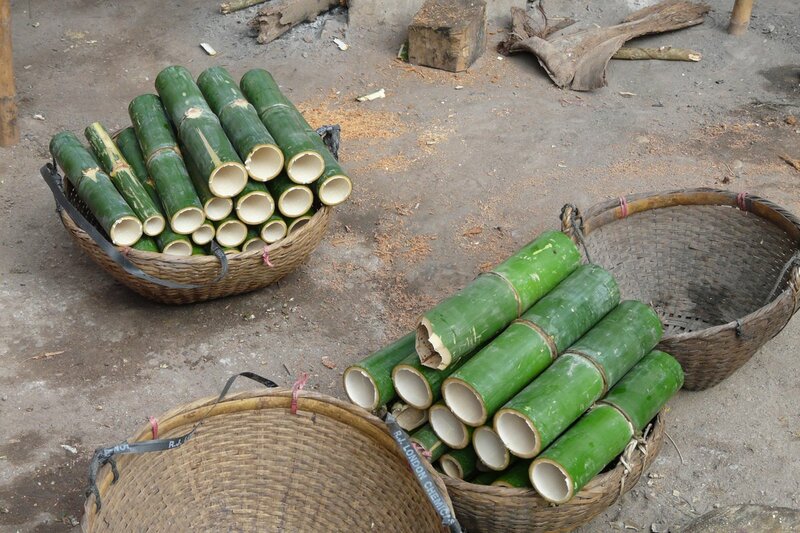 The village is popular for sugar cane and Kaolam (sticky rice and beans in bamboo), which are tasty local treats. We continue to cycle along green rice fields stopping in different villages and tribes to see how the locals live their daily lives. A local style lunch will be served in Ban Som. After lunch we continue cycling and pass the villages of Khmu and Lao Loum until we get to the beautiful waterfall, Tad Hoykoua (Hundred Families Waterfall). After taking a break we will cycle another 2 km to Ban Nongphou (Khmu and Hmong village), where the locals will host us for the night. Our accommodation is with a local family and is basic with a shared bathroom, but comfortable. On the second day of the tour you will enjoy a local breakfast prepared by your host family before it is time to say goodbye. In the morning we continue our cycling adventure on small trails that lead from village to village. Lunch will be at a bamboo hut in the middle of picturesque green rice fields where you can pause to take pictures. We continue on to a village where we can see villagers making local crafts such as pots, jars and vats. We next head towards the Mekong River, where we take the ferry to return to Luang Prabang in the late afternoon. Well-known makes of mountain bikes with lightweight alloy frames, 24- to 27-speed gearing, v-brakes and Shimano components and front suspension and helmets are included in this tour.